We live in an increasingly electronic, fast-paced world. Ideas are delivered in punchy, broad statements shared with the masses on social media. Today, people often read only the headline of an article. In such a setting, you may think that the handwritten letter is obsolete, but that assumption is far from the truth. 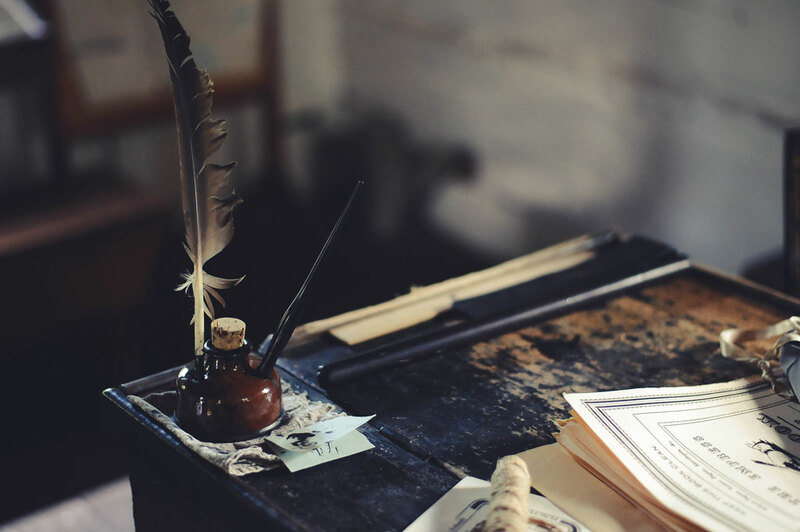 In this post, you’ll discover a brief history of handwritten letters and the impact they’ve had on nearly every aspect of society. Afterward, learn what these letters are capable of achieving in business environments. In the end, you’ll understand the power that handwritten letters had throughout history and how their potential is greater today than ever before. Every business that wants an advantage over the competition should be sending handwritten letters to customers and prospects. Throughout history, handwritten letters have made and broken livelihoods, turned enemies into friends, and helped fan or quell the flames of war. Before emojis or even the typewriter existed, the persuasive skill of the writer was the only viable tool to deliver a message. The skill of writing letters and personal correspondence became a style of fiction. This style is called the epistolary, in which a story is told entirely through letters the characters send to each other. But how did letters all begin? The earliest traceable point of permanent communication comes in the form of clay tablets from the Assyrian and Babylonian empires. These tablets helped clarify and explain complicated ideas and helped early thinkers establish the basis for astronomy. However, the tablets were barely portable compared to today’s conventions that use a mailed letter in an envelope. Letters, as we know them could only appear once a new standard for writing came — something lightweight, collapsible, and easily carried. Enter papyrus, a material that transformed Egypt. The wetland plant Cyperus papyrus contained a soft, sticky material called pith within the stem. This could be harvested, cut into thin strips, and overlapped into sheets. Once dried, papyrus sheets could be bound together into one long scroll. While ancient Egyptians produced papyrus for boat sails, floor mats, and other uses, its largest asset was holding ink without blurring it. We see proof of this quality in museums – highly detailed samples of papyrus scrolls still maintain the sharpness of their symbols. Experts debate who wrote the first letters since the definition of “letter” isn’t set in clay. Some researchers believe that person was Homer, author of legendary Greek literature such as “The Odyssey.” Homer’s works were circulated through oral retellings. It’s likely someone recorded them in writing at the first opportunity possible and addressed it to a reader as something important. Other historians believe the individual was Atossa, wife of Darius I, who wrote a letter around 500 B.C. Up until 1,500 B.C. written communication required knowledge of cuneiform and hieroglyphics. Only the educated nobility were able to read and write. This environment led to the creation of a new and easier reading and writing system. It designated consonant and vowel sounds to specific symbols or “letters” that were combined into words. The alphabet became easier to understand. People who weren’t among the nobility started learning to read and write. This adoption of reading and writing vastly increased the economic and academic potential of the world. Many variations on the same alphabet existed, but deviations fell away over the centuries. Since papyrus grew mainly in Alexandria, other societies far from Egypt were forced to create animal-based writing media such as vellum, which was made from the soft leather of calves or goats. Late into the 16th century, vellum and parchment were the standards for writing material. Then came paper, a Chinese invention from the second century. Combined with industrialization and the printing press, paper created the perfect elements for communication. At long last, writing paper, books, and the printed word were an expected commodity. Literacy skyrocketed further when the United States created compulsory education laws. Imagine how different those few centuries must have been compared to the past. For the first time, nearly anyone could take a piece of paper, write anything one wished to express, and send it to anyone in the world. Beyond that point, human history crunches down into volumes of letter-driven events. Events from the Age of Enlightenment all the way to the captivating letters between the late Vincent Van Gogh and his brother which give insight into the life of one of the greatest artists of all time. Letters added possibilities to the world on a never-imagined degree. Just think of all the developments that came from scribbles on a folded piece of paper. It may seem quaint in the age of instant messaging, but without the standard of communication set by paper letters, how different would our world be today? Some groups today insist on free communication as a basic human right. We could possibly never have such attitudes if not for our history of valuing education, expression, and writing. No matter what you do as a businessperson, letters remain an essential, enduring form of communication. The online world has unlocked many new possibilities for communication and outreach as a business, but it hasn’t erased the old ones. If you want an advantage over your competition, you need to get personal, heartfelt, and old-fashioned. You need to send authentic handwritten letters. The current marketing environment is characterized by one word: excess. People open their email accounts to find dozens or hundreds of unwanted messages from people they may not know. Additionally, they may know that most, if not all, are not addressed to a large list of prospective customers. As a result, “engagement marketing” has been a significant buzzword during the past several years of online marketing. The same sense of being overwhelmed and unimportant applies to social media. Twitter feeds are becoming an unreadable fire hose of rehashed content. Facebook has all but given up on organic discovery. Physical marketing, especially mail, is no better when people receive a bundle of junk mail daily. Only one form of communication has an unmistakable charm. The delivery method cuts through competition to touch your customers’ hearts: the handwritten letter. Explore the following ways a business can turn customers into permanent fans. Handwritten letters and cards can be used to thank customers for buying from you, signing up for a free trial, or completing a survey. Today, the only “thank you” a customer typically gets is at the checkout counter or on an online invoice page. Anyone will be surprised and charmed when you take a more elaborate and personal approach. That powerful reminder will pay off with more frequent sales. Word of mouth is another great reason to thank customers with a handwritten letter. People often discuss or share handwritten letters they’ve received with friends or family, especially now when receiving a handwritten letter occurs less often. Send a letter with such a benevolent reason as expressing thanks and the message will come across as heartfelt. You can bet that more than one person will hear about it. Don’t be tempted to think handwritten letters are only appropriate at certain times of the year when everyone is sending cards. The opposite is true; sending an unexpected letter to a customer, outside of any socially obligated time such as Christmas, is bound to come across as especially authentic. Do you have the dates of birth for all your customers? If so, you can send letters and gifts to wish them a happy birthday. Send cards or letters a few days ahead of someone’s birthday so that it will arrive on time. If you have customers who interact with you often on social media, listen to what they tell you and find opportunities to show that you care. If a mother is excited that her son is graduating from college, send a letter before the date of the ceremony. Show interest in your customers, and they’ll show interest in you. Asking for customers’ opinions is another great way to incorporate a handwritten letter/note into your marketing efforts. Consider this example of what you should not do: A customer signs up for a delivery service and each monthly product box contains a brief customer feedback card to complete and return by mail. This approach is impersonal, overdone, and asks too much of the customers without taking any effort for their sake first. Imagine instead that after three consistent months of ordering, customers find a handwritten letter or card in the mail thanking them for their business. The card or letter further asks whether or how the company can do better to serve them throughout the rest of the year. Requesting feedback from customers through handwritten letters gets a back-and-forth dialogue taking place. You can then, more naturally, ask them to leave reviews online. Alternatively, if they were thrilled with your product and have an interesting story behind how it helped them, you could ask them to provide a testimonial or case study interview to share with other customers like them. Handwrytten has everything you need to send handwritten letters that you design. You don’t need to write, stamp, or send them yourself. Through API integration with apps such as Zapier, Handwrytten can automatically send notes individually at the exact time for each customer. This is automation. For example, you can create a template and set a rule that a week after someone orders a product, Handwrytten’s system creates a card and sends it. Delivering handwritten notes to large groups and creating valuable customer relationships has never been so simple. Sharing special offers or promotions with VIP customers. Introducing a recent product change or service addition to what your business offers. Explaining a new plan your business has and including a survey to get customer feedback. Sharing a story from an especially satisfied and supportive customer. Organizing participants for a fun event. As Johann Wolfgang von Goethe observed, “Letters are among the most significant memorial a person can leave behind them.” Unlike every other form of marketing available, handwritten letters become precious keepsakes to your recipients. It’s an act which gives your business far more presence in their minds. Handwritten mail is an affordable, simple, powerful angle to stand out and shine above your competition. With Handwrytten optimizing the entire process, you stand only to gain from trying it out. The standard modern communication provides more convenience and speed than our predecessors could have imagined. But something has been lost along the way: a focus on the language and message through words. Today, the rare handwritten letter means a great deal to someone, regardless of whether it came from one’s grandmother or your real estate agent. Be a business that cares enough to write letters and you’ll see the benefits for yourself.